If you want to outdistance others, beat them to the punch, defer work till later, move to Kawagoe, climb over a wall, cross a mountain, be promoted over your boss, or simply excel, you'll need 越. It's also useful for violating borders and walking all over people. Finally, 越 enables you to cross into a new year—if you've taken the proper measures to welcome the New Year's gods. p. 20: Redefined: 年越し or 年越 (としこし) as "(1) seeing the old year out and the New Year in; (2) New Year's Eve; end of a year)." 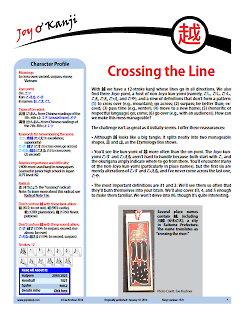 p. 22: Added a link back to this page so you can more easily access the game below. June 13, 2016: p. 10: Changed a sentence in the Answer to Quick Quiz 3 to be more consistent with what preceded that sentence. June 4, 2016: p. 16: Changed the definition of 越境 to "crossing a border, often illegally." Also changed the breakdown of 越境入学 to crossing a border (1st 2 kanji) + admission into school (last 2 kanji). May 22, 2015: Changed the 1st photo caption on p. 18 to reflect that in 皆さまのお越しを待ちしています, the お越し is a noun meaning "one's coming" in respectful language. July 18, 2014: Revised the photo caption on p. 6. Also added a translation for the sample sentence in Sidebar 3, as I figured that would be helpful! June 10, 2014: Originally published.